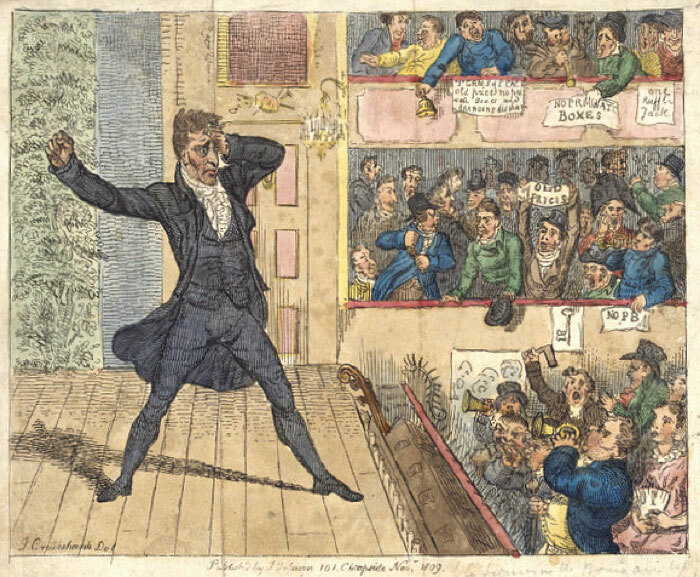 Isaac Cruikshank, King John’s First Appearance at the New Theatre, Covent Garden (November 1809). The image renders a baffled and distraught Kemble as King John (c.1166-1216), King of England from 1199-1216 and the villain king of the Robin Hood legends. In addition to losing Normandy and other English territories in France to Philip II of France and being excommunicated after refusing to accept Stephen Langton as the new Archbishop of Canterbury, King John is remembered for inciting civil war. His troubled dealings with the Church and increased taxation of barons (land-owning nobility), among other concerns, provoked retaliation. In 1215, rebel baron leaders marched into London, taking the capital, along with Lincoln, Northampton, and Exeter. At Runnymede, near Windsor, the King succumbed to the barons’ demands when he signed a document, stating that he accepted terms as they were outlined in the Magna Carta, which limited monarchical power and upheld individual rights over the wishes of the sovereign. Though King John later declared his statement invalid and resumed civil war, the Magna Carta became a formative document of English constitutional practice. Here, as in figures 31 and 32, Kemble is figured as an egotistical and incompetent King John, whose will opposes that of his people. © Victoria and Albert Museum, London.